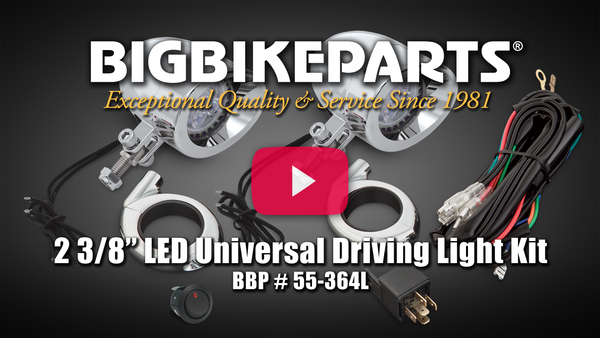 Rice Lake, WI – Big Bike Parts new MR16 high-output and high-intensity Litespan LED 2 3/8’’ Driving Light Kit is available in a universal cruiser fitment. 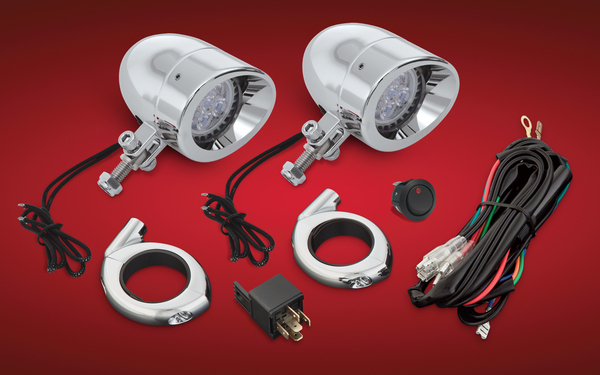 Custom die cast aluminum lights and fork mounts make an ideal fit on many cruisers, such as: Honda VT1300 Sabre & Stateline, VTX1300C, VT600, VT750 and VT1100; Harley Dyna models, pre-2000 FXR, XL Sportsters, FXS, FXDWG; Kawasaki VN900; Indian Scout; Yamaha XVS650, Stryker and XVS1100. The Litespan LED reflector bulbs produce 400 lumens each from 7 watt 6 LED output in bright white 4000k color. Their concentrated 20° beam angle puts more light down the road in front of you for a true driving light function. The die cast clamps fit cruisers with 38mm to 41mm forks and comes with a wire harness, relay, and switch.